A little used provision of the Immigration and Nationality Act may be making a lot of noise during the Trump administration. Attorney General Jeff Sessions has sent a memo to Assistant United States Attorneys nationwide asking them to start requesting Judicial Orders of Removal in federal criminal cases involving non-United States citizens. The effect of these requests would be to place the federal district judge, who may not be familiar with immigration issues, in the seat of an administrative immigration judge. The federal judge who presides over the criminal case would determine whether the person was deportable and whether there were any forms of relief available to the person. 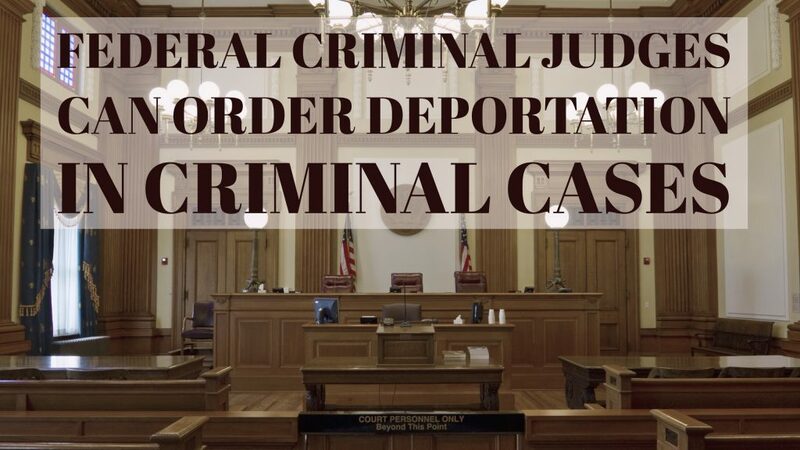 If the judge determines that the person is deportable and no form of relief is warranted, the district judge would order the removal of that person and there would be no further immigration proceedings. That means, the non-citizen would never go before an actual immigration judge. An inherent problem within this process is the lack of statutory or regulatory guidance for the process. What is the burden of proof? How strictly are the rules of evidence construed? Will these hearings (presumably held within the criminal sentencing hearing) look like the immigration individual hearing equivalent? The Department of Justice has previously issued guidance to its Assistant United States Attorneys suggesting that legislative changes should be made to provide more guidance for how these proceedings should be conducted. Should the Assistant U.S. Attorneys start to pursue judicial orders of removal on a regular basis, federal criminal defense attorneys will have to make a choice between fully immersing themselves in learning immigration law and deportation defense, or probably more wisely, employing outside immigration counsel experienced in removal/deportation defense. This is even more important in the federal criminal courtroom context because lawyers will have to educate federal judges who have no experience handling deportation cases. In order for an Assistant U.S. Attorney to seek a judicial order of removal, that prosecutor must follow a notification process prior to trial or sentencing. The Assistant U.S. Attorney must file a notice of intent to seek judicial order of removal prior to trial or entry of a guilty plea. Then, at least 30 days prior to sentencing, the Assistant United States Attorney must file a charge listing the alienage of the defendant and the criminal charge upon which the government is relying on to support removal. If the court determines that the defendant has provided substantial evidence to support a statutory basis for eligibility of relief, the commission will issue a report and recommend whether relief from removal should be granted. Although the government has historically had the authority to seek judicial orders of removal, this power has very rarely ever been used. The case law is scant and there is very little direction for all parties involved, including the defense attorney, the prosecutor and the judge. If the government follows through with this directive, you can expect the appellate courts to see a dramatic increase in appeals, as courts struggle to interpret the legislative intent. Jeff Sessions directive to his assistants is just one more indication that this administration is serious about targeting non-citizens charged with criminal offenses, no matter how small, no matter how long that person has been in the U.S., and no matter how many U.S. citizen immediate relatives that person has. This is another warning to seek an experienced immigration attorney if you or a loved one is a non-citizen charged with a crime.